Doing a decor for our backyard movie party is a little tricky. We were so excited, but we didn’t want it to be, you know, too much. So we tried to stay focus and keep it simple and sweet! When planning the decor for #MinutesToMidnight, we designed the moodboard based on ‘Before Sunrise’ and ‘Before Sunset’ movies’ color tones. Next step..we applied the color palette from the moodboard into the poster and decor elements. Luckily, some walls were already gray-painted so we just needed to add a little dash of yellow and black here and there. All of the decor things you see here was upcycled from used stuff or made from inexpensive materials you can easily find at the nearest store around you. For the signboard, we cut a used card box into an arrow-shape, wrapped it with a yellow duct-tape, and wrote the event’s name with a permanent marker. 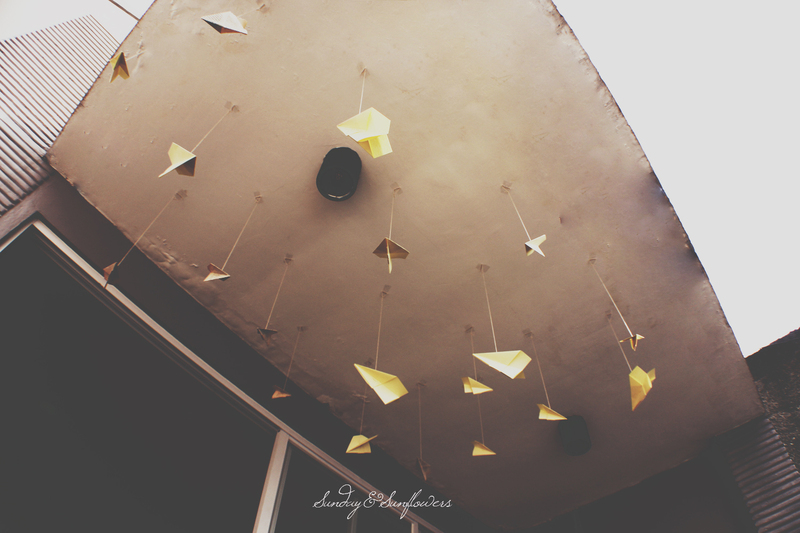 At the registration area, the guest was greeted with hanging paperplanes made from old book pages and yellow papers. As for the popcorn bag given to the guest after registration, we made a popcorn sign, printed it on a brown paper (we use samson paper, but you can use kraft paper or nasi uduk wrapper as well) then fold it into a paperbag. Another decor on the registration area was a quartet of simple mobile hangings made from spray-painted branches, fabric strips, and masking tape mini bunting. 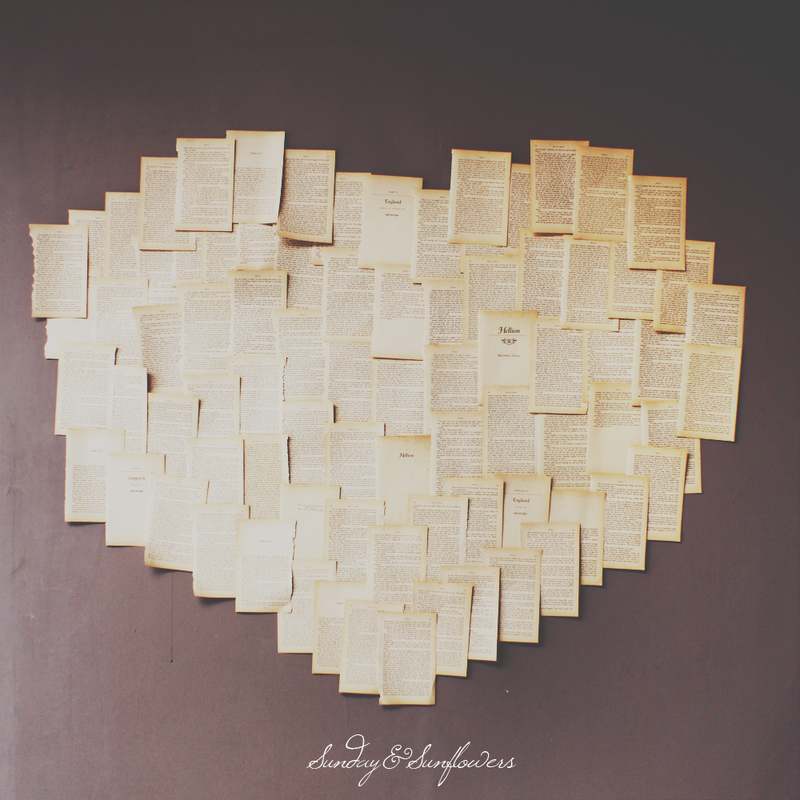 Besides the mural wall for the photobooth, there was a heart-shaped wall decor made from old book pages on a gray wall before the screening area where guests can took a picture of themselves. We did the same diy decor for the Tarot’s corner (but not in a heart shape of course), then we added a strand of mini lanterns. 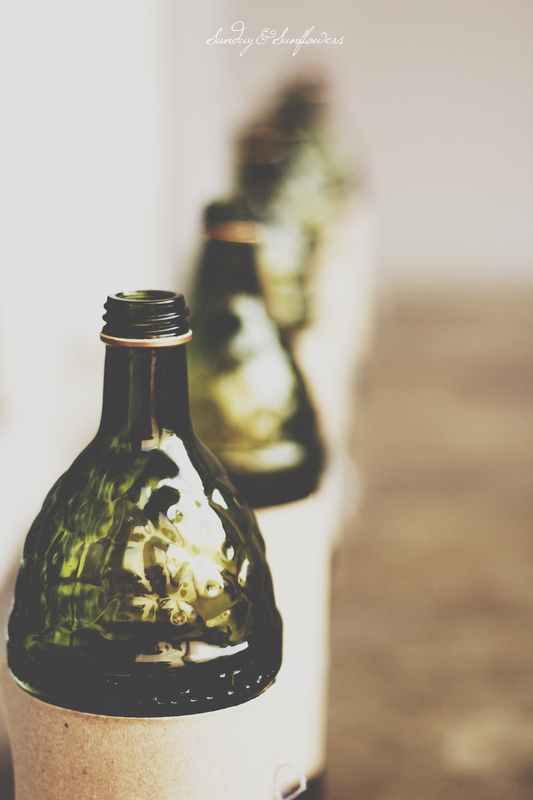 For the flower vase, we wrap a brown paper around an empty big bottle, then tied gray wool string over it. 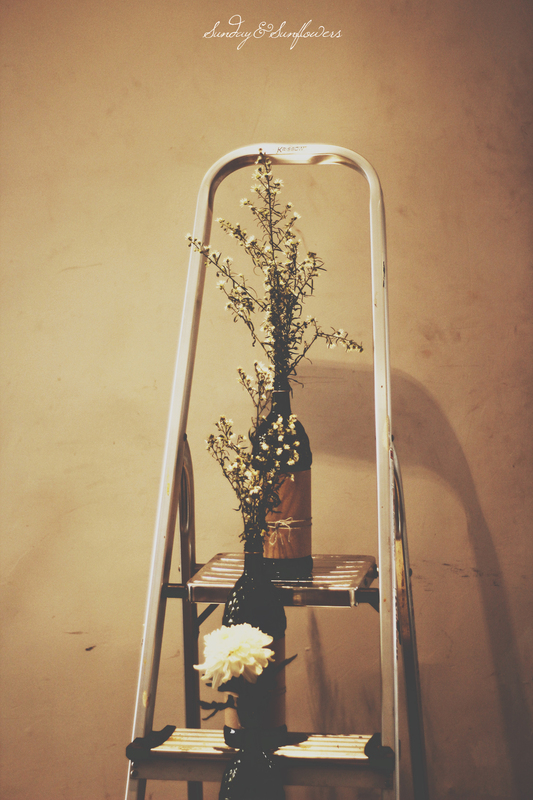 (the same thing we did for the vase on the registration area). 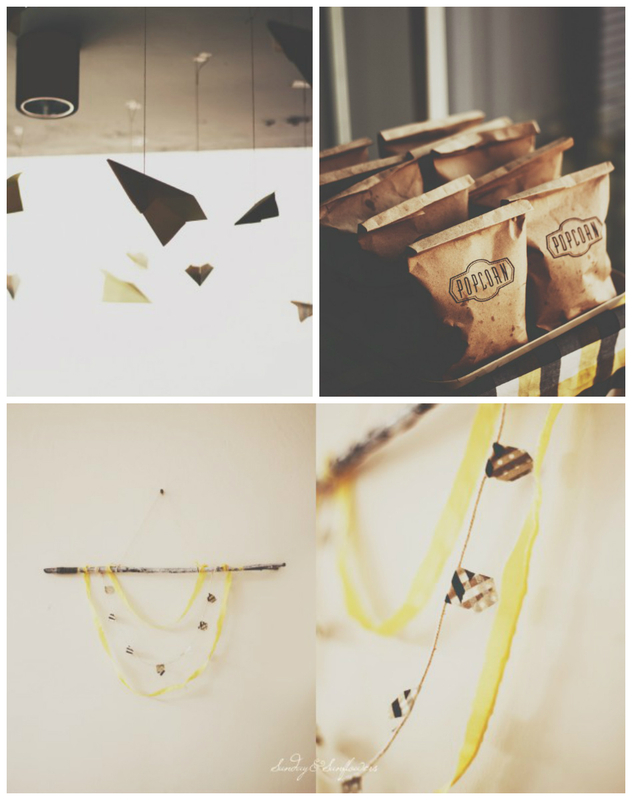 For the backdrop of our snack table, we cut a few strips from black, yellow, and gray plain cotton fabric. 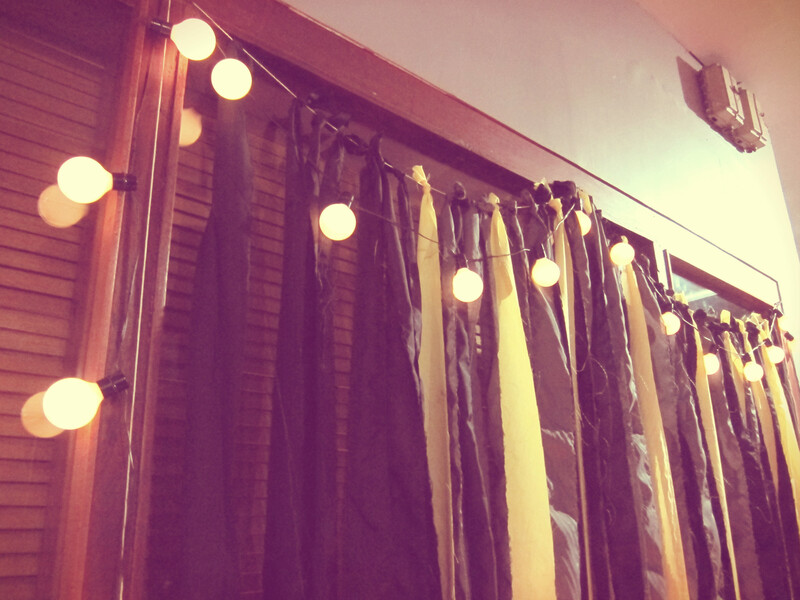 We tied the strips onto a string and hung it on the wall behind the table. As for the table setting, we arranged the plates on a different heights using stacked books.We put a few candles, flowers and fabric strips backdrop with string of lights too. For the screening area, our goal is to create a relaxed ambience so we just laid a few mats and rugs, threw a bunch of cushions over it, and added a couple of sofas and chairs. After that, just put on some christmas lights around the roof edges and we got ourselves a warm and cozy atmosphere, perfect for the screening! notes: All of the photos above, except for the pictures without watermarks, were captured and editted by Sunday & Sunflowers Photography.